A Dodge Charger Pursuit police car is a rather unwelcome sign in your rearview mirror. Especially if you've got an eye towards criminal pursuits and a mind to press your luck and your throttle pedal to make a run for it. Now, you better ask yourself... do you feel lucky, punk? Do you? We know what you're thinking. Is that Mopar-equipped Dodge Charger carrying the 292-horsepower 3.6-liter Pentastar V6, or does it have the 390-horsepower 5.7-liter Hemi V8 under the hood? Either way, this new Dodge cop car has a slew of features handed down from the minds at Mopar, including slide-out trunk trays, trunk ventilation (to keep expensive electronics cool), a 100-watt siren, and upgraded electrical systems. Dodge is offering police officers the choice of one of six quick-order packages so America's various law enforcement divisions can get the car that fits the job. 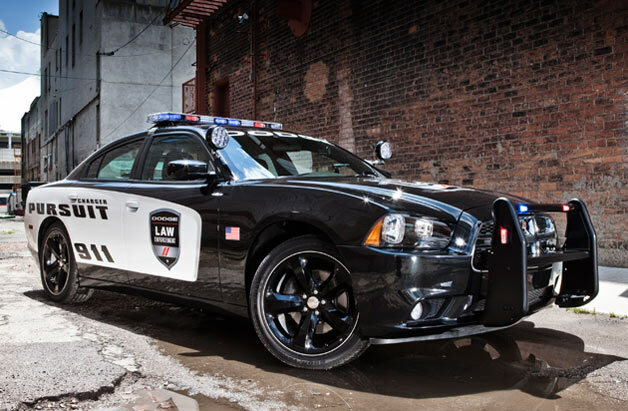 In addition to the pre-prepped vehicles, Mopar is offering 24 more items that an officer might want to make his cruiser even more battle ready. I hope it can do more than the 140 of the old one. id still be willing to risk it from a dig. In addition to the pre-prepped vehicles, Mopar is offering 24 more items that an officer might want to make his cruiser even more battle ready. NO WAY!!!!!! A car phone!